Posted on December 19, 2018 at 5:06 am. Let’s start things off with WOLF PACK PRIDE!! It’s SPIRIT WEEK here at WMS! Thanks to all the students and staff who wore their best flowered shirts for Hawaiian Day. You’ve got school spirit — yes you do!! Now here’s the rundown for the rest of the week: Spirit week continues with a blast-from-the-past on Thursday with Decade Day. And finally, Friday is our favorite holiday tradition: UGLY SWEATER DAY!! 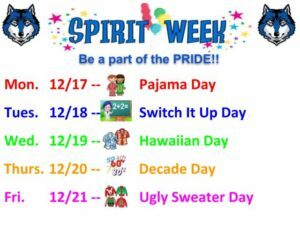 So get into the school spirit, wolves, and BE A PART OF THE PRIDE!! Calling all scientists, technicians, engineers, and mathematicians!! The Virginia Junior Academy of Science — or VJAS, for short — is gearing up for 2019. VJAS is a Statewide “STEM” Competition for 7th and 8th graders. For information about how to participate, please come to the interest meeting TODAY during WOLF TIME in the Science Trailer, WW 22. Again, the meeting is TODAY immediately following the Morning Announcements. See Ms. Warden with any questions. It’s the most wonderful time of the year – Time to return those OVERDUE library books! TA Teachers will be handing out overdue notices, so please bring those books back to the WMS Library before you head off for Winter Break!! Take the shot!! The WMS Girls Basketball season is nearly here. Tryouts are scheduled for the first week back from Winter Break. Interested athletes should sign up on the Activity Board by the cafeteria — and make sure to have a physical on file with Ms. Hogwood. See Ms. Sutphin with any questions. What are YOU doing after school next semester? If you’re looking for something FUN and CREATIVE, consider Mr. Dudek’s ACT II “Inventions” class. Stay tuned for more announcements following the Winter Holiday. The next great invention could be YOURS! !